Here is Mrs. Kays opinion on the court system. Then we have this, something the step it up campaign and shelters misinform people about, why is it they will not tell the honest truth about domestic violence. And on radical feminism, the exact thing we have been trying to expose, that women are as equal as men, women have achieved and can achieve without the radical feminists. The Family Coalition Party's support of traditional families was not well received by the audience. I wonder why pro-family candidates are not well received in a room full of feminists. This blog does not try to make decisions for you, only to inform the attitude of some towards the traditional family, mother, father, and children, together in harmony. The destruction of the traditional family has made our society more dependent on social programs, these programs are now personal political power for some, their ideas are simple, make more people dependent on them, they get more funding and more power, at the expense of the next generation. Do you like been a house wife? According to them your a slave to your husband, you should leave the raising of your children to a stranger or babysitter or daycare, that is their idea of the perfect feminist. Do you like to do both, that is our idea of freedom to be yourself. Here is the full interview of Barbara Kay. There is other women out there that exposes feminism for what it has become, like, the flipside of feminism by Suzanne Venker, definitely not a book liked by feminists, judging by the attacks online. We have other women, who hold power, not because of feminism but because of hard work and dedication, like Phyllis Schlafly, Sarah Palin, Kim Campbell, and many others, whether you like them of hate them, one thing is for sure, they achieve because of their gifts, not because someone handed it to them. Sarah Palin is a perfect example of what we can achieve by our own dedication, she and others like her, that is you and me, have been described as "the women only a man could love", not a woman who works hard, that is not only an insult to her, but to all of us who work hard. And yes Gloria, I love my husband and he loves me, I love my son and my daughter, and my father, brother, and all the men in our lives. Look up anti feminism on YouTube for instance, and you will find that most are...yes...Women, young women. Conservative women like you and me, who believes we can be both, mother and worker without the hatred of men. 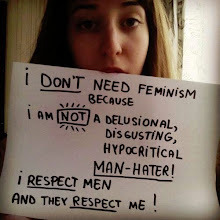 Feminism is over and we will make this world, a better place, there will always be chauvinism and feminism, but they will always be the minority. One as destructive as the other. OMG, I love this blog. The research and information is just incredible,thank you and keep it up. love the info u provided about the ndp candidate, but i am sure she knows about the court system, as u said, she was pandering or just trying to make the other candidates look bad, either way i am not voting for a party that doesnt tell the truth. Men and women should have the same rights, that is what this is all about, since the 1920. If one side gets more rights then arent we going to have to fight this all over again? u know my opinion, these women are crazy, hangry at men, power hungry at the expense of freedoms....u cant trust anyone anymore, even the ones that r supposed to protect us. we r on our own.